My cousin posted photos yesterday in the hope I could help identify them. None of them had any identifying information. Several we could figure out, they were mainly our great grandparents and one great uncle. Several are children I has never seen before, perhaps they were from her Mother’s side. And then there was this photo. A young women who looks much as I did as a young woman. She could be me. A mystery couple; is it the same woman? I see so many similarities: our hair, our eyebrows, our noses, our resting face, our lips. My glasses hide my eyes, but believe me they are similar. When I first saw the photo, I was startled. Under it my cousin had written: You resemble this woman. And I do. I am now haunted by her. Who is she? Is she a great aunt? A cousin? I am relatively sure she is NOT a grandmother of some generation. But if I was a time traveler, I think I would be her. I also love her dress. There is a bit of sparkle on the collar. All who know me, know that I love sparkle. I could wear a dress like that. Perhaps not the high collar. I do not like turtle neck shirts or high collars of any sort. The dress itself, is something I would wear. I imagine that it is blue, my favorite color. I think she is my doppelganger. I cannot quite get her out of my mind now. She also looks a bit like some of my cousin’s daughters. The family genes are strong. I really want to know who she is? Where she ended up? This photo was taken in the USA at a photo studio on Grand Street, NYC. So I at least do not have to worry about her dying in the Shoah. I think she might be one of my grandfather’s five or six sisters. I only ever met one as a child. There were four or five we never knew. We have another photo taken at the same studio. Is this her as well? Or a sister? I am similar to her as well. I think it might be her a few years older, with her husband. She has rings on her fingers now. But she is still wearing a top with a little drama to it, with all that lace! Then there is the location of Grand Street, in lower Manhattan. It runs parallel and a bit to the south of Delancey Street. My grandfather and great grandfather had a tailor shop on Delancey Street. Also the Bialystoker Synagogue is on Grand Street! Well we are all Bialystokers! The synagogue started life as a Methodist Episcopal Church, built in 1826. In 1905 it was purchased to be a synagogue. But more important it was started by the Chevra Anshei Chessed of Bialystok, and our great grandfather was extremely active in all Bialystoke communal organizations. The synagogue is an historic landmark. I think I need to go and see this synagogue!!! I am sure she is related somehow. There are so many connections. I just wish I knew how! I do not think I ever will unless another photo turns up with a name! In my heart, I wish that my ancestors had put names on the back of all the photos. The ones with names in Yiddish, or Hebrew, or Polish or German are so wonderful because we actually have a name. But the many photos that remain forever nameless sit in albums and wait for a name that will probably never come. This lack of identification concerns me as we go on to web-based photo collections. We need to keep some sort of identification for generations to come. 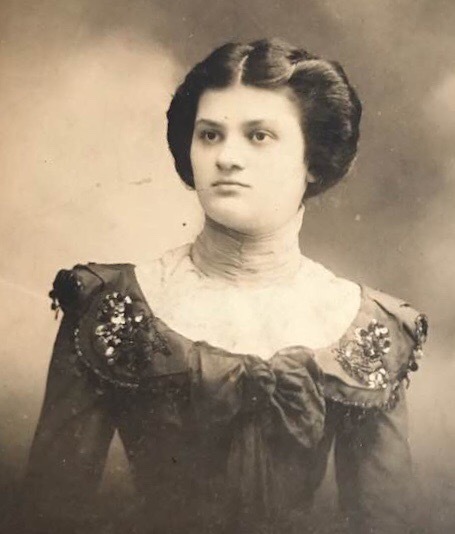 But for now, I will look at this photo of my familiar but unknown relative and truly wish I knew who this woman is, and how she might be related to me. Yesterday I told my daughter not to go to Jerusalem. She and her husband live in Holon, about an hour from Jerusalem. I know that violence will explode as Hamas lashes out over the US decision to recognize Jerusalem as Israel’s capital. It makes me ill. Nothing has really changed. But those who work toward hatred use it as a cry to kill and destroy. And the way the media and the politicians across the world reacts adds to the mob mentality of hatred. If you show people rabble rousing then they will turn into hate filled mobs. Why not use some common sense. And just relax. The US Congress recognized Jerusalem as the capitol of Israel decades ago. This is not news. I love Jerusalem. It is in my heart. I spent my sophomore year of college in a Jerusalem attending Hebrew University, living in both Givat Ram and then Har Hasofim campuses. I traveled the roads and went throughout the area surrounding Jerusalem with ease. In 1974 and 1975 we could easily go anywhere in and about Jerusalem. There was no intifada. There were no walls and barricades. We all went where we wanted. But still my family worried. It was less than a year after the Yom Kippur War. My Grandma Esther, who was born in the USA, would send me letters with newspaper clippings and write, “You could kill me in easier ways.” My Grandma Thelma, who was born in Poland, would send me letters telling me to meet up with her family who had come to Israel after the Shoah. My love of Jerusalem started before I even saw it, when I was 11 years old. The movie, “To Cast A Giant Shadow,” came out. I went to see it with my cousins and grandmas during the summer. I sat next to Grandma Rose, my cousins’ grandma. But we shared her. She had been a citizen of Jerusalem during the siege in 1948 when the Arab nations declared war on Israel after the UN declared the new country of Israel. Jews in the Jewish Quarter of the old city were cut off without food or water as the siege started. They survived due to old hidden waters in the City. Grandma Rose, Grandpa Asher and Uncle Jack survived. But Grandma Rose told me she never forgot looking back to her city, to Jerusalem and wondering if she would ever see it again, when she was forced to leave. When all the Jews, families who had lived there for centuries, were taken out of the city by the Jordanian soldiers. She did not go back, but she never forgot. She died in the USA. When I lived in Jerusalem, I was there when Uncle Jack returned for the first time, 26 years after he had been forced out as young man. My uncle and aunt came to Israel for their 25 wedding anniversary. And I got the benefit of being with them as my Uncle relived his childhood and told me about the siege and how they survived. He also never forget the last look back as he left his home. I have been to Jerusalem many times. The heart of Israel. Where the Israeli government has its parliament, the Knesset; where the Israeli Supreme Court makes decisions that benefit those of all religions; where the holy sites of Jews, Christians and Moslems exist in close proximity. It was in Jerusalem, the city of peace, that I was taught to use an Uzi and an M-16 automatic rifle to survive. It was soon after the Yom Kippur War and it was not always safe. It was in Jerusalem that I became used to the bus drivers who would walk through the bus and ask about every package to find out who it belonged to , to make sure there were no bombs. It was in Jerusalem that I felt the ground shake as the military detonated bombs it had found nearby in an empty field. The terrorist groups have been attacking Jerusalem and Israel for decades. Nothing seems to stop it. There is always another reason they claim to try to kill or cause chaos. So this decision really changes nothing. The violence ebbs and flows like a tide. I have been to the Temple Mount and visited the mosques; I have seen the tomb of Jesus in the Church of the Holy Sepulcher and the Church of Nativity in Bethlehem; The tomb of Rachel on the road to Bethlehem; the tomb of the Patriarchs in Hebron. Some of these places are difficult for Jews to access now. Every time I go to Jerusalem now, I see signs of hatred rising. I love Jerusalem, like many others say they love it as well. But some times I wonder about their signs of love; they are are hard to decipher, to understand. Throwing stones, setting fires, stabbing, terrorists attacks. These are not signs of a people loving a city. These are signs of destruction. Recently I was at the Harry Truman Presidential Library. I read about his recognizing the State of Israel and how so many American and international politicians were against this decision. But he did what he thought was right. The world survived. Instead of focusing on the one issue of Jerusalem, why is the world not focusing on the proxy war between the Shia and Sunni that is taking place in Syria? Why not focus on the war occurring in Yemen? Why not see the horrors that are happening in Turkey? Why not Iran and Saudi Arabia? Hundreds of thousands people have been killed. Millions have been displaced. Israel has nothing to do with any of it… so the Arab world stays silent. Jerusalem is not the reason for all these conflicts. There are much bigger conflicts within the Moslem Arab nations that is causing unrest in the Middle East. I hope one day there will be a end of hostilities. That both sides will decide to just live in peace. That they will move forward and not ruminate on the past. To be honest neither side can win, unless they let the past go free.